esterday I said I didn't think it was that bad, well it was worse than I thought! That's a lot, I was surprised to see that much stuff was misplaced. Plus, I'll be needing those garden trimmers soon, so this was good timing. 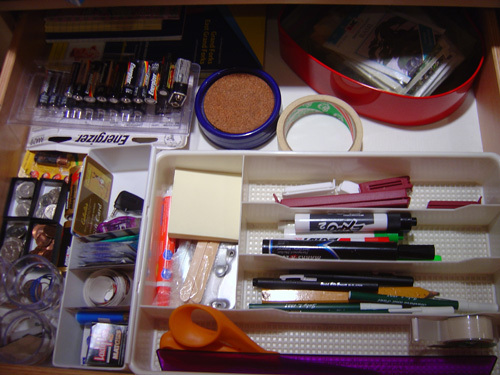 A clean empty drawer, notice the bottom is lined with shelf liner. I do this so it's easy to wipe down and the drawer doesn't get ruined if a pen leaks or explodes. All of my drawers are lined with shelf liner or drawer liner. When clothes are involved it helps prevent snags, for those drawers I use lightly lavendar scented paper drawer liner. You can see that paper under the bits in my vanity drawer. I just adore it! I bought two boxes with a $50 gift certificate to Crabtree & Evelyn I had gotten for Christmas two years ago from my grandmother. After I cut the sheets to size I cut the remaining edges into squares and tucked them into purses and shoes and anywhere that could use a little touch of freshness. I mentioned having an extra flatware tray that I use for that drawer, but I wanted to share what I would do if I didn't have that tray. So, if I just wanted temporary containers while I was working out what I would need in the drawer long term, this is what I would do. The small glasses are a little bigger than shot glass size and one is cracked, so we don't usually use them as a set, so this is perfect. 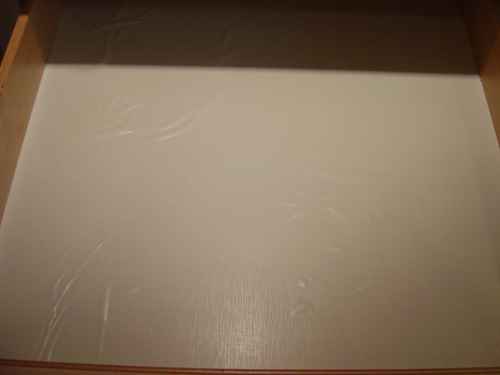 The long narrow boxes are cut from cereal boxes, two tops and two bottoms. You can't quite see it, but down the far right side I have a pair of scissors and a ruler, they don't fit in the box. So, for permanent solutions I know I would need at least one longer tray, or a bigger cereal box. I cut dividers for the small white tray in the lower left out of the same cereal boxes, to separate out the matches, stamps, lens wipes, gift cards and USB thumb drive. The coins are separated into four small black box tops. 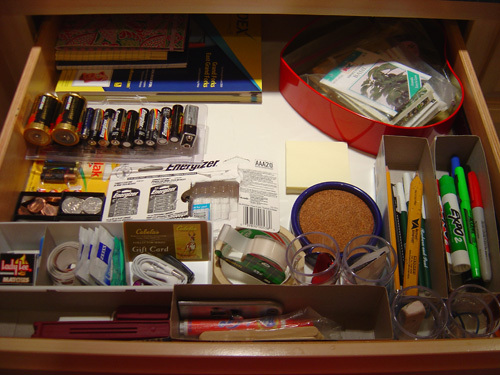 Eventually, a box outside of the junk drawer would be ideal for the batteries, or a set of rechargable batteries with a charger would be nice. The heart tin holds seed packets and cut flower food, this could obviously use a better solution. Finally, this isn't what I would call permanent, since there are still areas that can improve, but this is with my flatware tray in place. You'll see it actually works quite well since there is one very long spot for my ruler and scissors. It's almost like I could have picked this out to replace the four box tops/bottoms with the additional long section need fulfilled. This is how it will stay for a little while at least. I really like the idea of the cut down cereal boxes. Would work great in a pinch & just a wonderful idea. I'm feeling a little inspired but I'll have to wait since I've got a ton to do today. Love the ideas though. I have a bunch of the white trays that you see in the drawer, but kind of felt that would be cheating. The whole point was that you don't have to go out and buy something to organize, especially not right away. It's better to live with it a bit to find out what you really need before spending the money. The best feeling in the world! Isn't it funny how junk drawers just happen? Well done organizing!! Bless your heart, for sharing the real place you started from! Meredith: Have to be honest. I often get email's expressing amazement at how organized I am. I have my clutter and disorganized areas like everyone else. This blog provides me with accountability and an excuse to have fun with the organization and decluttering. Isn't it amazing how many things we accumulate over such a short amount of time? Truth be told mine looks a bit like yours did if not worse. Thanks for the motivation to fix that. Tamy: I know... 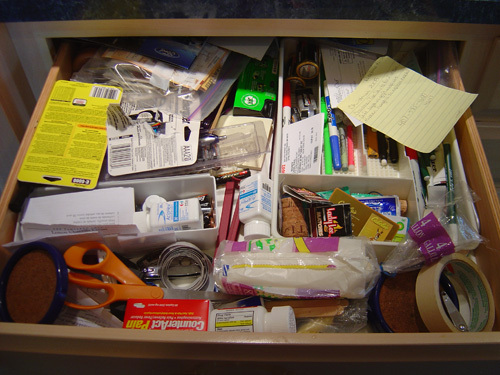 I go in and out of that drawer so often I think I became immune to it because it got out of order slowly over time. I knew it needed straightening, obviously since it's the drawer I was leaning towards... but whew... that was a bit embarrassing, but I wanted to be honest. I totally have a couple of these type of drawers! 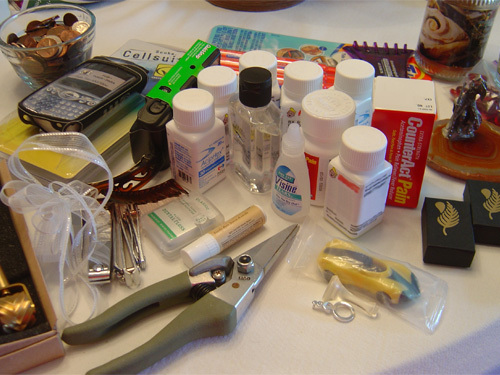 Hey Barbara, I have a question for you - after I clean out my junk drawer, what should I do if I have a lot of things that don't have another home? We just moved not too long ago and I'm trying to get things organized in other parts of the house (closets, etc.) but there are many things kind of hanging around that don't have a home yet. What should I do about that? Can you give me an idea of the types of items? I think my answer may depend on the item. Creating a catch-all spot (tray, basket, bin, bowl, drawer) in each room helps until you have it all organized and a home for it. For instance stuff that really belongs in your office, but there's no place for it yet, keep a catch-all container in the office. Once you get to that room, put them away in what will be their permanent home. The catch-all spots are like that room's junk drawer, but I really only advocate this until you get to that room. Also, don't go out and buy things for this purpose, because hopefully once you are all moved in, settled and unpacked the catch-all will no longer be needed. If you want to make them permanent, kind of a temporary holder until you can go through it, keep it small to force yourself to go through it often. When I first move to a new place, my catch-all containers tend to be laundry baskets. When I move to a new place, each area/room gets a laundry basket or rubbermaid tote, I prefer laundry baskets because I can see what in them even at the bottom. The are easy to carry around when I finally get to that room, and they wipe out easily when I'm done with the room and will be using it for laundry.